Measuring Orton's victories, his rookie season was successful. His 15 starts and 10 victories are both rookie records for Bears quarterbacks. 10 rookie wins is also sixth most in the NFL since 1970. As of 2017[update], Orton held at least 5 other Bears rookie franchise records, including completions (190), attempts (368), passing yards (1,869), passing TDs (9), and interceptions in a single game (5 on Sep 25 against Cincinnati). ^ NFL.com, Texans fall to Bears in Schaub's debut[permanent dead link], (August 11, 2007). Retrieved on August 13, 2007. 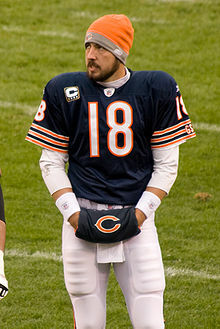 Wikimedia Commons has media related to Kyle Orton.